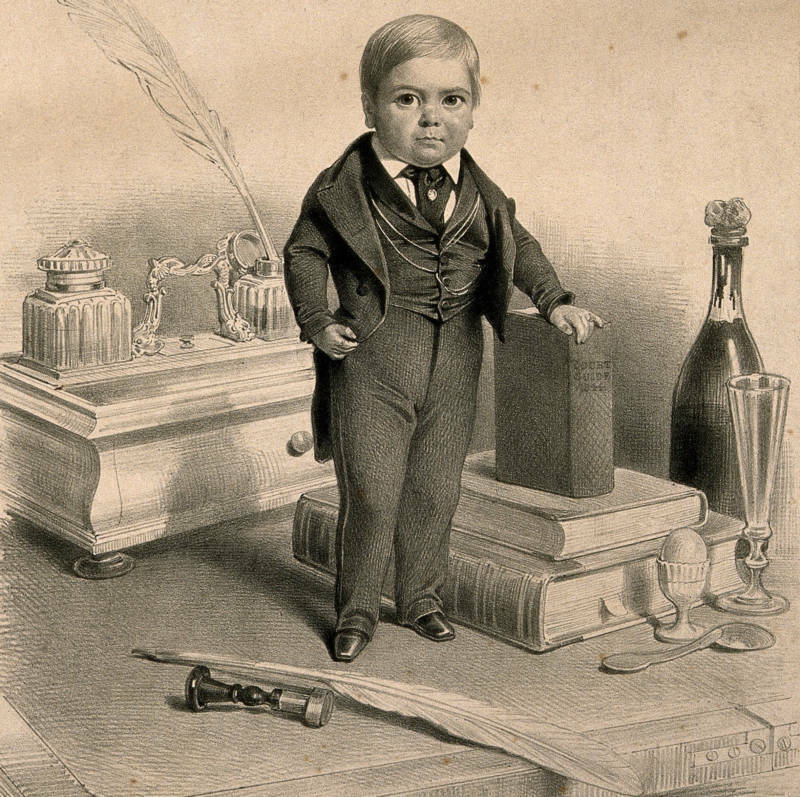 Tom Thumb in 1844 at the age of six. General Tom Thumb brought unparalleled joy to at least 50 million people in his lifetime. The man, once known as Charles Stratton, rarely knew a life away from the stage thanks to P.T. Barnum’s combination of shrewd marketing and timely performances. Some would say Barnum’s action’s on behalf of Stratton were exploitative, but what is certain is the unprecedented celebrity status Stratton achieved at Barnum’s side. Charles Stratton was born on Jan. 4, 1838, in Bridgeport, Connecticut, to a carpenter and a housewife. Both of his parents were of normal height and stature, but young Stratton was not so fortunate. He stopped growing when he reached just six months old and would not begin to grow again until much later on in his life. On a cold winter day in November of 1842, P.T. Barnum sought the legendary four-year-old boy who weighed as much as an infant. The toddler weighed just 15 pounds and stood 2’1″, or 25 inches tall. P.T. 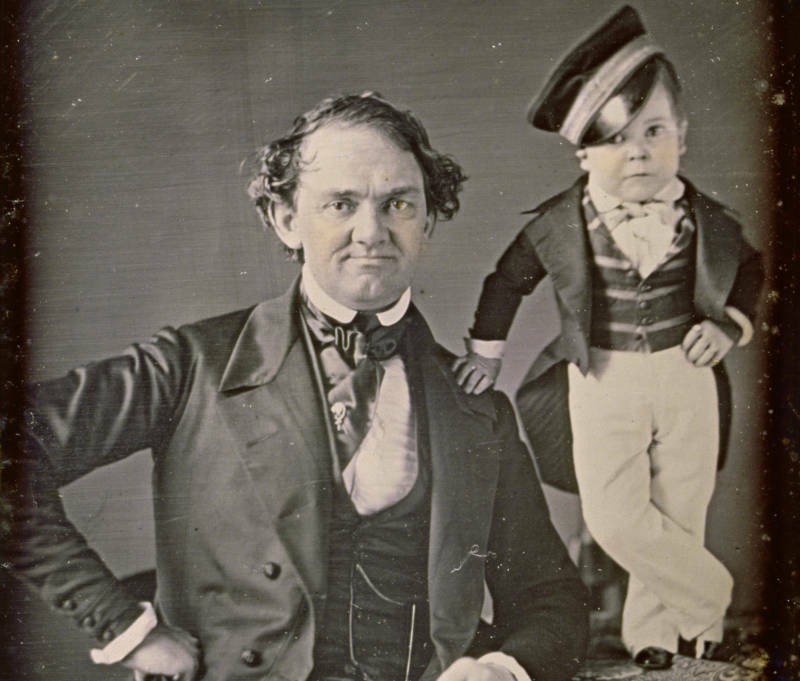 Barnum (left) alongside General Tom Thumb, circa 1850. 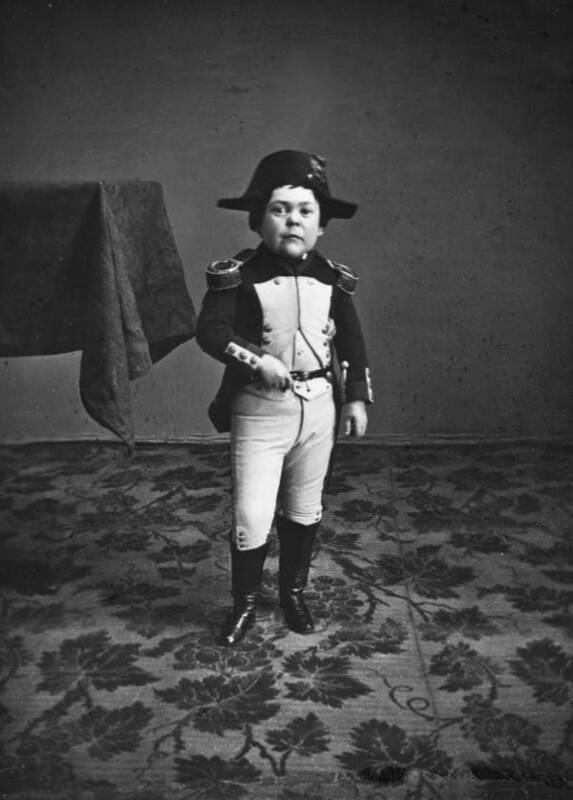 General Tom Thumb was 12 at the time. The greatest showman wanted to add some new attractions to his already-famous Hall of Living Curiosities in New York City. Barnum’s museum usually featured giants, so Stratton would be a perfect counterpoint to the behemoths that people currently went to see. Barnum offered $3 a week to Charlie’s parents, and then it was off to New York. Backstage at Barnum’s museum, Charlie was taught how to become a showman. The youngster ate up Barnum’s lessons quickly and the toddler soon became the most popular attraction in the Hall of Living Curiosities. Tom Thumb proved to be a talented mimic and showman. Regular shows featured the tiny tot as Napoleon Bonaparte (known for his short stature) or a character from the Scottish Highlands (in an ironic turn of comedy). Instead of marketing him as four-years-old, Barnum lied and said General Tom Thumb was 11 and from England. Barnum changed the age to avoid accusations of exploitation. The stage name came from English folklore, and crowds loved it. Barnum often performed with General Tom on stage to witness his child prodigy first hand. 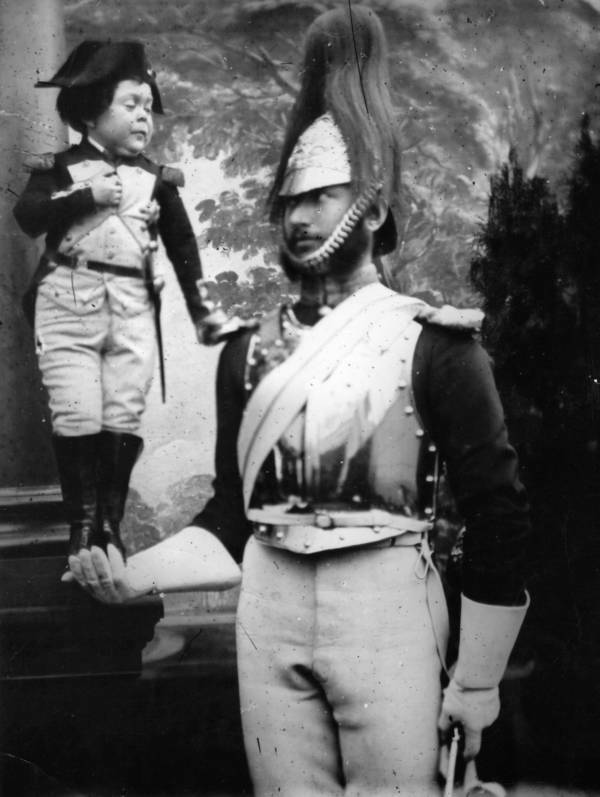 Tom Thumb standing on the hand of a Guardsman, circa 1875. No one seemed to question whether or not Barnum exploited Charlie. At the time of General Tom Thumb’s prominence, exhibitions of people’s physical disabilities were seen as totally normal. Perhaps the diminutive youngster loved being the center of attention. Rather than thinking his disability was something to be ashamed of, Charlie seemed to fully embrace it. After a month-long trial run, Charlie became a permanent fixture. Barnum upped the weekly salary to an astounding $50 per week (an enormous sum at that time) and Charlie lived with his mom in an apartment above the museum. In early 1844, Barnum decided to take six-year-old General Tom Thumb to England. The folk hero was originally from England, after all, so what better way to make Charlie an international star? There was a worry that the British would view the spectacle as unsavory. Their first few performances went ill-received. But a visit with Queen Victoria following the death of Prince Albert’s father would change that. 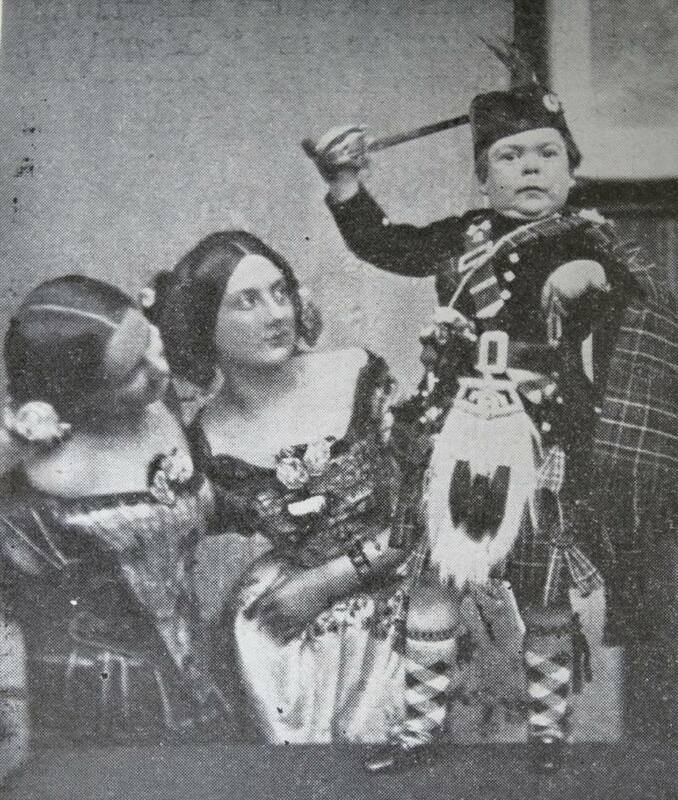 General Tom Thumb in highland dress, 1860. “[The queen and her court] were standing at the farther end of the room when the doors were thrown open, and the General walked in, looking like a wax doll gifted with the power of locomotion. Surprise and pleasure were depicted on the countenances of the royal circle at beholding this remarkable specimen of humanity so much smaller than they had evidently expected to find him. The part of the show that made everyone laugh was the end. General Tom Thumb had to exit the ballroom, but he couldn’t turn his back to the queen (per royal etiquette rules). Instead, he ran a few steps, turned around and bowed. After following this regimen a few times, a dog started barking at Charlie, who then proceeded to pretend to fight with the dog using this walking stick. Everyone guffawed at the performance. Tom Thumb dressed as Napoleon I. Not only did Barnum and General Tom Thumb get an invitation to perform again, but they also embarked on a three-year tour of Europe following this stint. Huge crowds flocked to see General Tom Thumb, who was particularly popular with young women, who would line up for blocks to get a kiss from Barnum’s main attraction. Europe was an utter success, but Barnum wasn’t done with Charlie quite yet. By 1856, Barnum decided General Tom Thumb needed an American tour. For a year, the major cities got to see the funny dwarf, who by now reached his maximum height of 3 feet and weighed 70 pounds. In 1863, Barnum arranged the celebrity wedding of the century. General Tom Thumb married another of Barnum’s curiosities, Lavinia Warren. Warren was also incredibly tiny, know as the “Little Queen of Beauty.” The two met and fell in love. Barnum threw them a lavish ceremony at Grace Episcopal Cathedral in New York City. 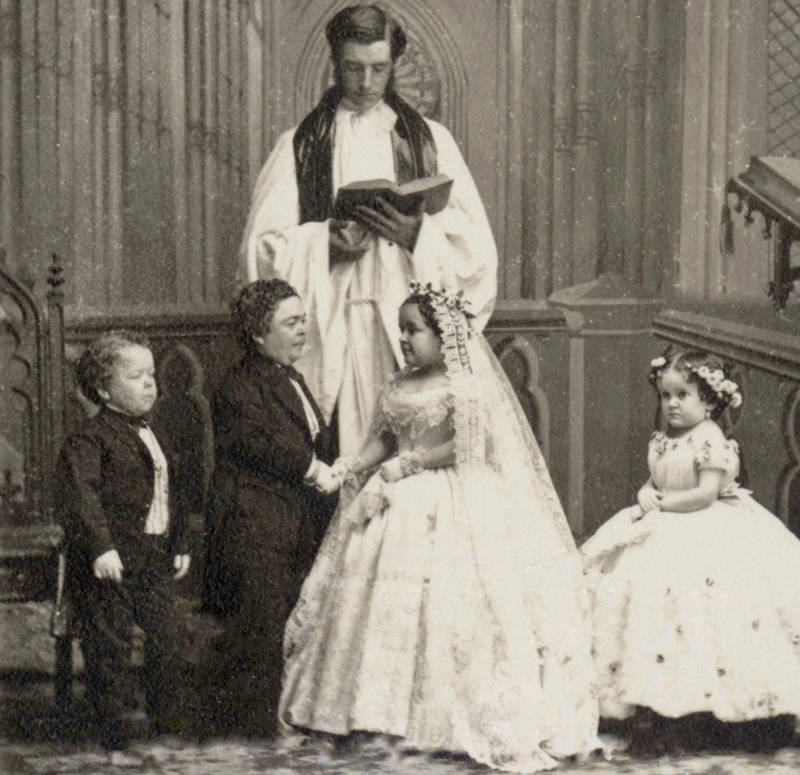 General Tom Thumb’s wedding in New York City in February 1863. The New York Times ran a feature article entitled, “The Loving Liliputians” on the day after their wedding. People lined up for blocks to get a glimpse of the couple, much in the same way Britons lined up for miles to see the weddings of the royals. Following the wedding, they honeymooned at the White House and performed for Abraham Lincoln. Barnum paraded the married couple around, sometimes with a baby in tow. This is when accusations of exploitation hit their peak. Barnum quickly dropped the act of the little family by claiming the baby died. Lavinia wrote in her autobiography that the baby’s “death” was a hoax. There was evidence that the couple did, in fact, have a child. 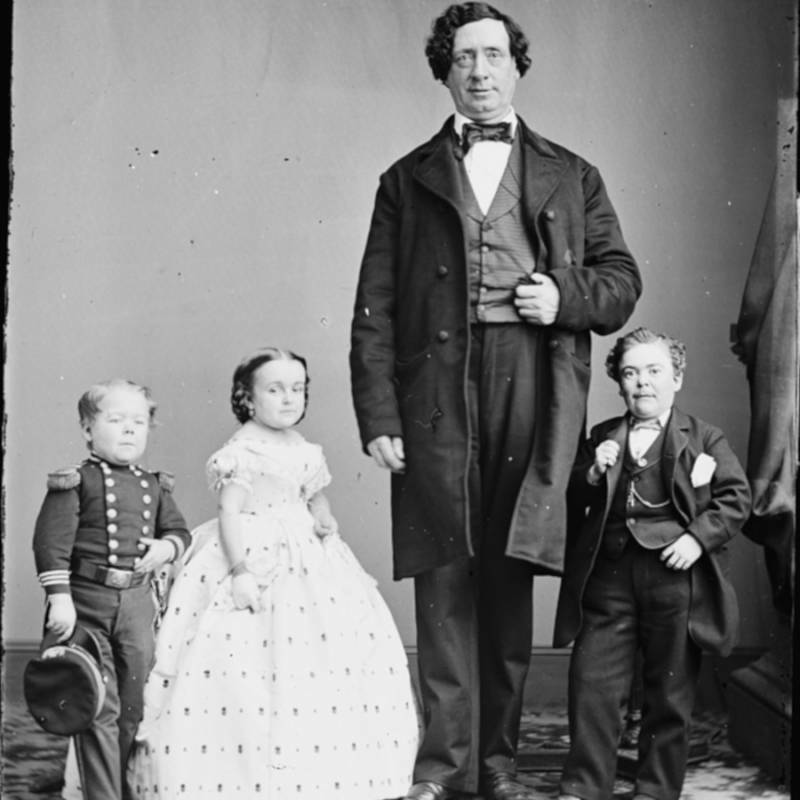 In the late 1860s, General Tom Thumb and his wife embarked on a world tour. This time, they went to Australia, China and Asia. Everywhere they went, huge crowds continued to follow. Charles Stratton lived a lavish life as an adult. He bought a luxurious house in New York City, and he made huge sums of money as P.T. Barnum’s main attraction. General Tom Thumb, left, standing next to Lavinia Warren, his future wife, sometime between 1855 and 1865. Charlie died in 1883 at the age of 45 from a stroke. Contemporary medical experts agree that he and his wife suffered from growth hormone deficiency, a condition related to a faulty pituitary gland in the brain. Whether that condition factored into Stratton’s death is uncertain. His widow remarried 10 years later and lived until 1919. Whether Charlie Sutton suffered from exploitation or not, one thing is certain: General Tom Thumb was an international superstar. He had adoring fans in every corner of the planet. Upon his death, tens of thousands of people traveled to view his gravesite. P.T. Barnum himself would be buried just a few away from his most precious performer.